The matriarch of the Khongiya Barooah family of Thengal, Kamal Kumari Barooah (1899 - 1978) embodied the qualities of the ideal Assamese woman. Daughter of Mohendranath Mahanta of Borelengi Satra and Swarnalata Mahanta, she imbibed early the attributes of character that enabled her to manage the huge Thengal household when she married Siva Prasad Barooah in 1917. For two decades she remained in the shadow of her illustrious husband. Though shy and soft - spoken, she possessed inner strength and individuality, which stood her in good stead when her husband died in 1938. Far from allowing the loss to overwhelm her, she summoned up the requisite self - control to retain the family properties for her children. Induced to running the tea - gardens with no one to help her, at a time when women were considered incapable of entering the male - dominated world of commerce, she self - educated herself in English as well as in tea craft, and efficiently managed these. That, despite having to operate within an inimical environment, she succeeded in retaining the family properties was the crowning glory of her life. This marks her out as a pioneer woman - entrepreneur in a male - dominated world, and an inspiration to others in the future. Along with prominent women of her time she was involved with social activities. 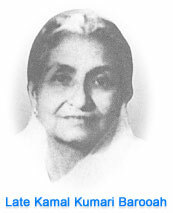 Endowed with an egalitarian ethos and an inexhaustible fund of humour, Aita, as she was affectionately called, was an object of universal affection. Her generosity matched that of her husband's: that the Kamal Kumari Foundation has been set up in her memory is a fitting tribute to this remarkable lady. 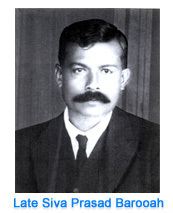 Pioneer planter, path - breaker in Assamese journalism, renowned philanthropist, politician and humanist, Siva Prasad Barooah (1880 - 1938) was a man of many parts. In his time 'the biggest Indian Tea Planter', as an unflinching advocate of Assamese sub - nationalism he hammered home the truth that economic self - reliance was the key to the survival of any society. During his life the Khongiya Barooah family emerged as the champion of Assamese interests and repository of Assamese culture and traditions. SADINIYA BATORI a weekly newspaper in Assamese, started by Siva Prasad Barooah in October, 1930 evolved into DAINIK BATORI on August 12, 1935 with Siva Prasad Barooah as Chief Editor and Publisher and Nilmoni Phukan as Editor. Dainik Batori soon became an articulate spokesman for Assam's aspirations and a zealous guardian of her interests. Dainik Batori became a milestone, and earned for itself and Siva Prasad Barooah a permanent place in the journalistic history of Assam. It is indeed apt that this National Award for Journalism has been instituted in memory of Siva Prasad Barooah.